In the long run, the dollar should be weaker. But when will the long run arrive? The U.S. dollar’s startling rally has upended markets around the world. Burgeoning U.S. deficits due to tax cuts and higher spending should mean a weaker dollar in the long run, as investors demand a discount to buy U.S. assets. But when will the long run arrive? The dollar’s second-quarter rise was as sharp as it was unexpected. 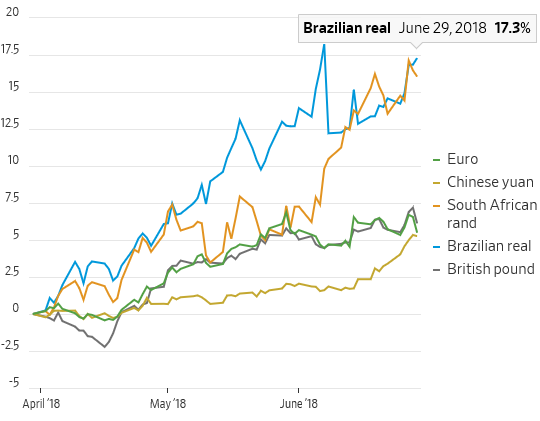 It rose 5.5% against the euro and racked up double-digit percentage gains against emerging-market currencies like the Brazilian real and South African rand. The rout reached China late in June, with the yuan falling 4% in just a couple of weeks. The greenback rose as U.S. growth barreled along while the rest of the world proved less buoyant than hoped. Additional fuel for the move has come from concerns about an escalating trade war—the U.S. and China imposed tariffs on each other’s exports Friday—and political stresses in Europe and some developing countries. For now, the rush of better U.S. growth has proved stronger than the fear of the consequences of wider U.S. budget and current-account deficits that have to be financed. The gain has been taken before the potential pain. That could persist for a while yet. There have been tentative signs of stabilization in economic data outside the U.S., but the idea of synchronized global growth has taken a hammering. 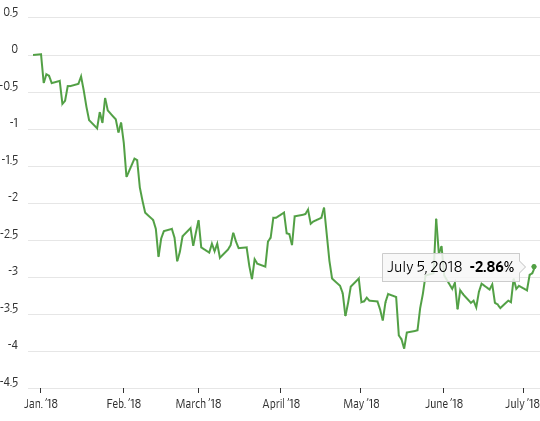 Trade-war fears are still concentrated outside the U.S. and the Federal Reserve is alone in methodically raising interest rates. At the same time, longer-term concerns haven’t gone away. For signs of when then might become a problem for the dollar, investors should pay attention to the U.S. corporate-bond market, thinks Morgan Stanley . Low interest rates globally have led foreign investors to pile in, chasing higher returns. For instance, Japan’s holdings of U.S. corporate debt have risen by more than 50% to nearly $250 billion since the start of 2016, according to U.S. Treasury data. However, corporate bonds have turned into a losing trade, hit by both higher Treasury yields and wider credit spreads. If foreign investors start to pull back, pushing up borrowing costs further, that could weigh on prospects for U.S. growth—and on the dollar. 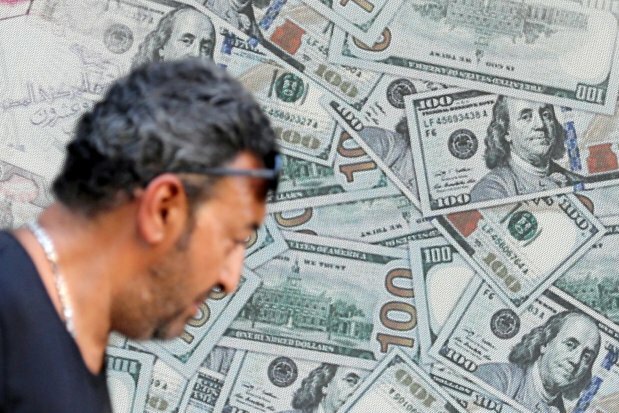 With the rest of the world facing challenges, the dollar’s strength can continue for now. But the bill for the higher growth the U.S. is currently enjoying can’t be put off forever. Eventually, the dollar will have to pay the price.